Jessica hails from the tropical paradise, Chicago, IL. She began improvising back in the dark ages as part of her high school’s Comedy Sportz cast. Jessica has completed WIT’s curriculum where she fell in love with long-form improv. She can currently be found performing with her indie team, Company Blood Drive, consisting of her 10 soulmates. Jessica recently made it to the FIST X finals while pretending it was 1996 again with Boy Meets Dawson’s Slayer by the Bell (who now go by Dreamlover). 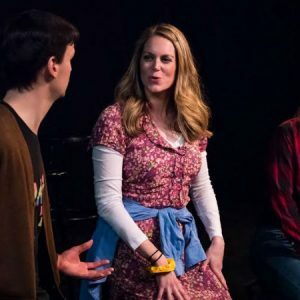 Jessica’s sister is thrilled with her involvement in improv noting, “you always liked being so weird as a child, I’m so glad you found something that suits your weirdness.” Jessica is still debating whether to take that as a compliment or insult. Off the stage, Jessica can be found traveling the world, trying to run without falling, and creating doodles. Stormin’ Norman given my striking resemblance to Norman Schwarzkopf Jr. and involvement in the Persian War. Whatever takes the least physical exertion, which is whipping my hair back and forth.